Alarms are ringing in the Center of Disease Control and Prevention (CDC), The American Psychological Association (APA) and the National Sleep Foundation (NSF): this is one sleep deprived nation. The CDC reported that more than one third of adults get less than the recommended amount of sleep. Surely, the percentage of sleep deprived parents is even higher (even if we exclude parents of newborns when sleep deprivation is mostly unavoidable). 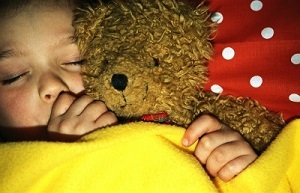 The APA cites 69 percent of children with sleep problems at least a few nights per week. How much sleep does your child need? The NSF suggests that toddlers aged 1 to 3 years need 12-14 hours per day; preschoolers 3 to 5 years need 11-13 hours per day. Without adequate sleep, children are at risk for increased stress from increased cortisol levels, decreased memory and learning, compromised immune system and muscle repair, insulin resistance that leads to obesity and a higher coincidence of ADHD. Bodies and minds need sleep, much more than the current national averages. What’s happening in homes across America? The busyness of an ordinary day is creating havoc with the peacefulness of night. Parents know all the books and all the strategies: Solve Your Child’s Sleep Problems by Ferber, Healthy Sleep Habits, Happy Children by Weissbluth, Nighttime Parenting: How to Get Your Baby and Child to Sleep by Sears, Sleeping Through the Night by Mindell or The No-Cry Sleep Solution by Pantley. Something is amiss however when parents try to “convince” their children to follow the program, any program. Yes, the kids know parents are trying to sell them on something the parents themselves haven’t bought! A culture of sleep deprived grown-ups cannot raise a generation of sleep satisfied kids. The answer to sleep problems will not be found in a book if parents don’t believe deeply and truly that sleep is a gift. Every sleep “solution” requires daytime planning. Here are a few daytime adjustments to ease your child into restful night time habits. Remember, your child does not come with an “off” switch. 1. Keep scheduled activities in balance. Kids need playtime and open-ended activities to learn self-regulation. 2. Continue daily nap times, though not after 4:00, for children who are not getting recommending sleep hours at night. 3. Institute “quiet time” for non-nappers to learn how to relax: time to read, to listen to music, and to daydream. 4. Monitor over-dependence on TV, videos, computer games, iPads and smart phones that inhibit resourceful alternatives when unplugged. 5. Increase serotonin producing foods like turkey, chicken, milk, eggs, nuts, bananas, beans, fish, and cheese. Watch out for sugar and caffeine. 6. Create “love rituals” to connect during optimal day hours: silly dance time after school, snuggling on a backyard swing after dinner, or bath time karaoke. Guilty parents will always have trouble setting nighttime limits. Here are a few tried-n-true bedtime recommendations. Instead of bedtime dread, practice believing that bedtime is the well-deserved frosting on a good-enough day. Remember, believe it or don’t do it! 1. Have a consistent bedtime. Your child’s body will thank you. 2. Let predictable routines prepare your child’s mind and body – bath time, good night to the moon and 10 minutes of stories or conversation. 3. Let your child fall asleep in the bed. Falling asleep in one location and waking up in another does not breed feelings of trust and security. 4. Give your child a “lovey” as a tangible expression of your love to hold through the night. Give older children fear-busters: a flashlight, a No Monster! sign at the door, or an invisibility shield that covers them all night long. 5. Add a personal ritual just between you and your child: a special “I love you”, a sweet tickle, fairy dust or happy dream sprinkles. 6. Tell your child every morning how you checked on her while she was sleeping. Embellish your story with silly anecdotes or actual photos of her sleeping. Finally, plan on disruptions when your child is sick or going through a growth spurt, vacations change routines, adjusting to a new school, or unpreventable childhood nightmares occur. 1. Give comfort freely. Pain and fear is always worse in the middle of the night. 2. Know that whatever you “do” during these periods of time will have to be “untaught” in a week or two. Think before you try any easy-way-out solutions. 3. Get back to your loving sleep routine as soon as possible. Your child’s growth and development as well as your sanity depend on it. Most importantly, make sleep a non-negotiable priority in your house. It is. Your family’s health and well being hangs in the balance of peaceful nights.